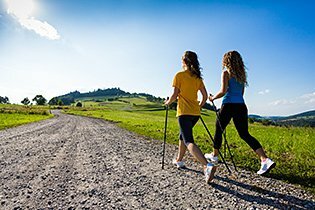 Bad Liebenzell is just the right spot to experience Nordic walking. Four routes for walkers with poles have been specially designated here; classified as easy, moderate and difficult. All four routes start at the centrally located spa park of Bad Liebenzell; there is even a pulse monitor provided for the track. Please download the brochure of the four routes here or ask for it at the hotel. Right outside the door of the Ringhotel Mönchs Waldhotel lies a trail network of more than 360km. Start into the nature of the Black Forest and enjoy the highlights of the various hikes. For example, the “Great Panoramic Tour” starting at Bad Liebenzell, or the “Alpine Way” offering an impressive view over the valley of Nagold. Not too far is the famous Western Route. Starting in Pforzheim, you lace up your hiking boots for a day on this legendary route. We will be happy to advise you which hike to choose. Our team of receptionists will provide you a range of maps and tips on particularly beautiful routes. Let’s go for the modern version of the treasure hunt. Using a GPS device you start at the hotel and go on a treasure hunt. It goes over hill and dale, passing wild animal enclosures and habitats. A great and inexpensive activity for the whole family. 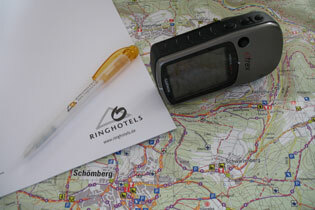 There are many geo-caching routes waiting for you around the Mönchs Waldhotel. The trails vary in length between 2 and 12km, featuring several levels of difficulty. This allows families to find a suitable treasure hunt according to the age of the children. 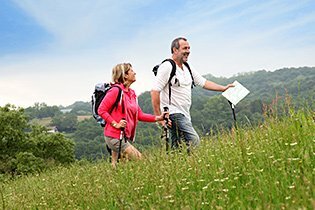 Let your passion for exploration run wild, find more out about geo-caching in Nagoldtal here and about the offers in Schomberg here.